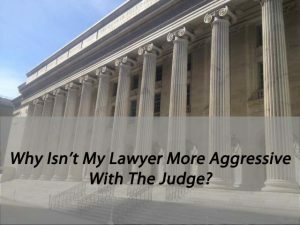 Why Isn’t My Lawyer Getting More Aggressive With The Judge? Why Isn’t My Lawyer Getting More Aggressive With The Judge? The perception that a criminal defense lawyer is not “fighting for you” in court because the lawyer is well known and well received by the District Attorney/Prosecutor is a common flaw in the thinking of persons uninitiated to the criminal justice system. The advertisements that flood the internet and our television screens of flamboyant “pit bull” trial lawyers prey on those who believe the more aggressive you appear with a Judge for example – the better the result. A truly experienced criminal defense lawyer will understand the nuanced approach theat is necessary to not only win the plea bargain or the trial, but to win the sentencing hearing if a case reaches that stage. Unduly simplistic or overly passionate criminal defense lawyers may have superficial appeal to their clients but in the long run – looking back over time – those same clients realize that the results these lawyers obtain are most often the very worst results that can occur in the criminal justice system. I see these lawyers everyday. They believe their passion and zealousness are helping their clients in court. After all – what is more appealing than a young lawyer bold enough to stand up to a Judge? The damage these well meaning lawyers cause in the lives of their clients is both real and, in many cases, irreversible. There are times when it is necessary to disagree with a Judge. But there is almost never a time when it is necessary to interrupt the Judge. Knowing when and how to use the “tools of the trial lawyer” is what separates the experienced professional from the bumbling fool. Knee-jerk reactions – angry, out of control displays of “passion” may be temporarily applauded by a client, but irrational displays demonstrating a lack of control are usually followed with handcuffs that are clicked into place as the echoes of juvenile lawyer tirades fade away. Simple Rule Number 1 – the only goal of the criminal defense lawyer is to represent his or her client (the male pronoun is intended to include the female gender)… If zealous advocacy requires a lawyer to sacrifice that lawyer’s pride to their client’s cause – it is the client’s cause that must be the first priority of the lawyer. The cause of the client must always be paramount. Many lawyers, it seems especially the young and inexperienced lawyers I see daily, have a poor grasp of the reality of the relationship between a Judge and a lawyer in the courtroom. Simple Rule Number 2 – a criminal defense lawyer is NOT somehow “entitled” to speak when a Judge is telling that lawyer to stop interrupting the Judge’s words. A lawyer facing the wrath of a Judge must put his client’s interests above his own “feelings.” Good lawyering means shutting up when the lawyer is hurting his client’s case. A criminal defense lawyer and a Judge are not equals in the courtroom. If the lawyer can’t handle that reality – get out of the courtroom now. Displays of irrational temper may seem “chill” to the client – but they are just “bad” from a tactical perspective. Hubris has no place in the courtroom when the lawyer is responsible for another’s life. A clue to why this is a true statement – Judges are human. Yes the make mistakes and yes a criminal defense lawyer has the right to point those mistakes out to the Judge. But how you tell a Judge the Judge got it wrong, and how you help the Judge fix that mistake is usually the difference between the effective criminal defense lawyer and the so called raging “pit bull” so coveted by the general public. At all times – the lawyer should try to remain calm, cool and collected. Always use diplomacy and tact. Never, ever insult, or be insulting to a Judge. While the lawyer may disagree with the Judge on a point of law – he or she should never make it personal. The criminal defense lawyer should be as professional as possible at all times and he or she should know, as it has been my experience to learn well after 35 years in the courtroom, the Judge is trying to make the right decision. Therefore – while a lawyer may disagree with a Judge, he should do so in a helpful and professional way – especially where the Judge eventually comprehends that he has no choice but to rule in the client’s favor. If the lawyer is right – he must not rub salt into the wound – he should offer a Judge a face saving way out of the ruling that is both a reasonable way out and is helpful to the client’s case. If the lawyer is “right” on an important but contentious point and is at trial – he must not point the correction out in front of the jury. He should either approach the bench outside of the hearing of the jury or ask for a recess to raise the issue when the jury has left. If a Judge’s error will not impact the outcome of the case, the lawyer should not have the need to point that out to the Judge in open court. The lawyer should pick his battles and “let it go” if there is no advantage to the client by confronting the Judge’s error. If a lawyer needs has trouble understanding this critical point – the lawyer should take up the game of chess or watch every season of “Game of Thrones.” A lawyer must learn to make sacrifices for the client. “Being right” does not mean winning the chess game or winning the throne. The need to be “right” above all else – above the cause of the client – is one of the most egregious and foolish errors that I watch day in and day out of the courtroom. The criminal defense lawyer must be aware at all times how his conduct appears both to the Judge or to the Judge and the jury if a case is in jury trial. Seasoned trial lawyers know that juries respect the Judge and for that reason alone it is important to be discreet and poised at trial at all ti. If a criminal defense lawyer loses a ruling he should never “let it show.” A trial is not the time for grandstanding. A lawyer should never show pique or anger at a Judge’s ruling. To do so risks alienating not only the Judge – but the jury. Simply put, juries believe that the Judge is there to “protect” them. When the criminal defense lawyer loses control and seeks to try to retaliate against the Judge in an effort to somehow undermine the Judge’s authority or to somehow vindicate that lawyer’s pride, it is an exercise fraught with danger and it is done at the peril of the client.